A leading member of Malawi’s opposition United Democratic Front (UDF) party says President Bingu Wa Mutharika’s government acted irresponsibly when it “secretly” purchased a multi-million dollar presidential jet. Fahad Assani says last year’s purchase signifies the misplaced priorities of Mr. Mutharika’s government. 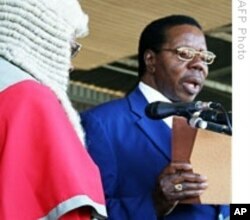 “In our view as a majority of Malawians, the timing was very, very wrong. When you buy a presidential jet when the poor are suffering with poverty, it becomes something that is unreasonable…and also the government and the head of state (are) quite insensitive to the people. Buying a presidential jet at this time just proves how irresponsible that decision can be,” he said. The government purchased the jet for $13.26 million - - a move opposition parties sharply condemned. Malawi’s minister of finance recently informed parliament that President Mutharika’s administration made some payments toward the purchase. But Assani says the government kept the plane’s acquisition a secret. “The strangest thing is that government did not even advise the nation through parliament or in the budget that they are going to acquire that state of the art presidential jet at the time when it was being purchased. So it was done behind people’s knowledge, only to have rumors that it had purchased that presidential jet,” Assani said. Following the transaction, one of Malawi’s major donors, Britain, reduced its budget support from 22 million pounds ($ 32,953,003) last year to 19 million pounds ($ 28,460,824) this year. In a statement, the British government said its Department for International Development (DFID) “has reduced budget support to the Government of Malawi to make it clear that our funding must be spent in ways that benefit poor people… We have strong systems in place to ensure our aid is used to reduce poverty and gets to those who it need most," the statement read. About 40 percent of Malawi’s economy is reportedly funded by international donor support. But information minister Leckford Thotho denied the jet purchase was controversial, saying it was less expensive to buy the plane than to contract outside help and equipment. “For government to come up with that decision, we had to make a cost-benefit analysis. It is cheaper and more effective to have a jet than to pay hiring. Hiring is more expensive,” Thotho said. Political observers express concern the presidential purchase could deflate donor confidence.